Exquisite and unique textures and overlays for photographers, digital artists and designers Examples and tutorials in texture photography. Build your own texture pack! Recently I kind of re-discovered my own Build Your Own Texture Pack and actually used some textures, that I had forgotten about. 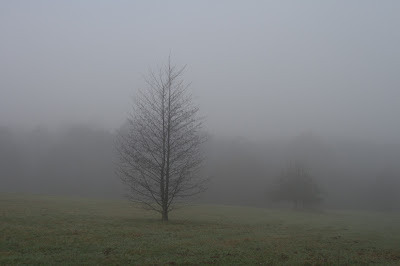 Today's picture is once again some very moody autumn shot taken a few years back on a foggy November morning. Let's start with the finished image. Mouseover will reveal the picture that I imported in Photoshop. First I treated the exposure. I aimed at making it brighter avoiding to blow out the already light fog while retaining the soft silhouettes of the forest in the background. Then I wanted a different mood. I initially had a much colder atmosphere in mind, so I initially went for a more bluish tone in the fog which I achieved with a colour temperature around 5000K.